Fissure sealants or dental sealants are thin plastic coatings which are placed on the chewing surfaces of permanent back teeth (molar and premolar teeth) to prevent them from getting decayed. The chewing surfaces of the back teeth normally have deep grooves which are called fissures. These fissures can lead to accumulation of plaque, which is often difficult to clean. The idea is to seal the grooves present on the molar (chewing) teeth, which cannot be completely cleaned by tooth brushing. The fissures and grooves are sealed with a biocompatible material that flows into the depressions and hardens (with the help of a light source), so that no bacteria/food can accumulate and hide in these areas, which could eventually lead to teeth decay if not addressed. They also make the chewing surfaces easy to clean. Children usually benefit the most from getting sealants around the age of 6, when the chewing surface of their molar and premolar teeth erupts beyond the gum. 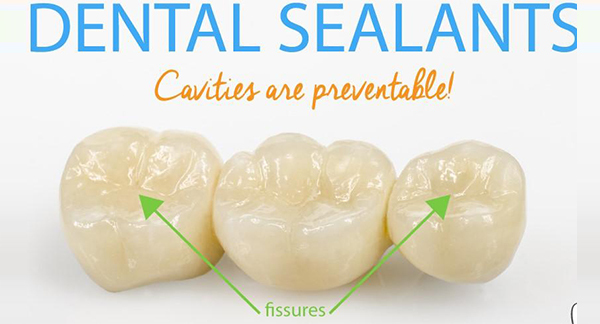 Dental sealants can last up to 10 years, but they need to be checked and replaced at regular dental check-ups, if required. They are easy and quick to apply, without anaesthetic and cutting the tooth structure. According to the popular saying, Prevention is better than cure, it is beneficial to get fissures sealed before they can develop decay! To book your appointment, please give us a call on 99898565 or book online at www.normanhurstdental.com.au.